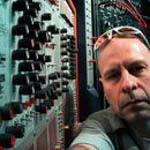 Born in 1954 Gareth Jones is an English music producer and engineer notable for working with Depeche Mode, Einstürzende Neubauten, Wire and Erasure amongst many others. Trained at the BBC, he began working at “Pathway” studios in the late Seventies where he recorded and mixed John Foxx’s Metamatic album in 1980 and the first Madness single, “The Prince”, in 1979. He helped build “The Garden” studio for John Foxx and worked with Tuxedomoon & Depeche there. Shortly afterwards he moved to Berlin and worked at the famous “Hansa” studio, where he continued experimenting with recording atmospheres and creating his own sound, making the three “Berlin Albums” with Depeche Mode. Gareth Jones was a pioneer in the use of digital equipment (including the then new sampling technology), combined with Analogue recording techniques and synthesizers. He worked with many bands in Berlin including Depeche & Einstürzende Neubauten, Nick Cave and the Bad Seeds, Fad Gadget, Wire, Diamanda Galas. He also recorded and mixed 2 soundtracks for Wim Wenders. Production work (often including mixing) includes Emmy the Great, Wild Palms, We Have Band, These New Puritans, Clinic & Polly Scattergood.